Summertime family reunions may leave you feeling inspired to create or display a family tree in your home. The holidays—particularly Thanksgiving—also invoke nostalgia, and you find yourself wanting to dust off the old family photos to give them a place of more prominence than the shoebox they've been hiding in. There are a number of ways to honor your family's history with customized family tree art and accessories you can either order online or make yourself. 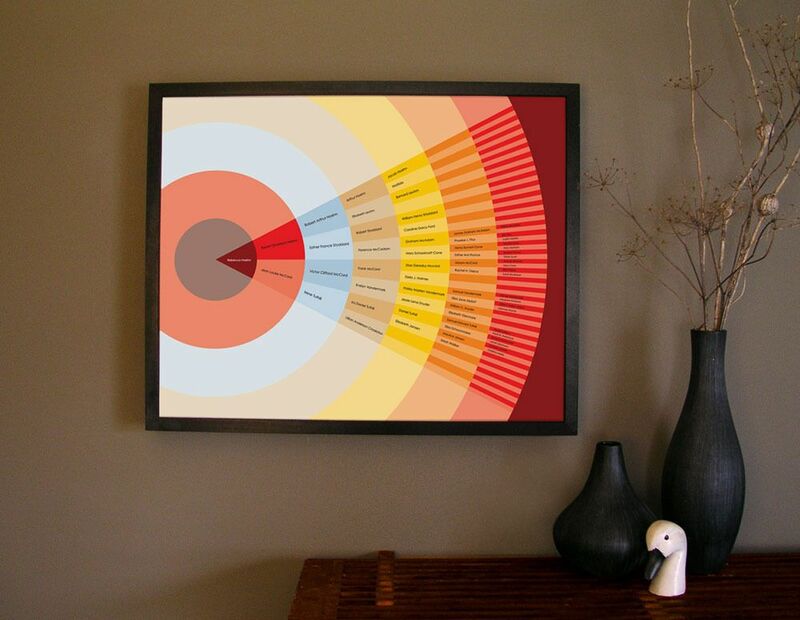 Displaying your family's genealogy in your home is a wonderful way to create a meaningful space, whether it's with a custom piece of art purchased through an online retailer, a gallery wall that you put together yourself, or a handcrafted accessory that puts a unique spin on the traditional idea of a family tree. Here are some ideas to inspire you. A family tree doesn't have to look like a tree at all. The graphic designs offered by My Tree and Me are fresh and non-traditional, offering a modern touch to your home while still honoring the past. Wall decals in the shape of trees are popular and easy to find. Why not hang family photos on the branches? This is a great way to display your family tree in a big way in a family room or even a dining room. One of the easiest ways to create a family tree is to order a customized one from places like Minted. You choose the pictures, the caption, the frame, and the color scheme, and it arrives on your doorstep ready to hang. Don't have pictures of everyone in your family? Consider a piece of art that uses everyone's names instead. Etsy has tons of sellers willing to create customized family trees for you. Here is another example of customized family tree art found on Etsy. This one is best for displaying the names of immediate family only and would look great in a child's nursery. You could create a DIY version of this idea with an actual wood slice purchased from a craft store. If you don't want to hang a piece of art, there are other ways to display a family tree, such as on an embroidered pillow cover. Spell out your genealogy with Scrabble tiles, like This Is Sesame did above, and mount it in a shadowbox frame for a clever take on a traditional family tree. Decorating with nature is inexpensive and fun. Find a tree branch that you can anchor in a vase, then hang tags made from wood slices or pressed leaves on it—one for each member of your family. This literal translation of a family tree from Simply Vintage Girl is both stunning and interactive. Chalkboards are trendy and versatile and look particularly great with old black and white photos. Frame a large chalkboard like Leigh Anne from Your Home Based Mom did, and arrange photos depicting your genealogy on it, then write names and captions on it with a chalkboard pen.